The Divine Living Space Blog: ORC Week 3: Making progress in the multipurpose room! ORC Week 3: Making progress in the multipurpose room! It's week three of the One Room Challenge, and man am I exhausted. I have never been so excited to be done with a project! Running a business, taking on a renovation, and managing the kiddos through homeschooling... well, let's just say I am a walking zombie by dinner time. We are half way through this design challenge and I can finally see the light at the end of the tunnel! 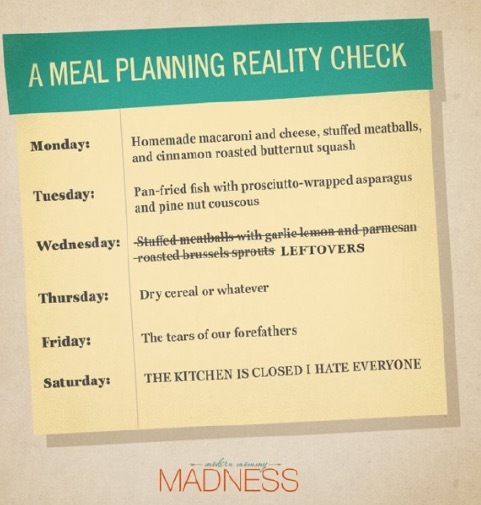 My friend texted me this "meal plan" picture and Saturday's are pretty much what I'm feeling every day of the week right now. This week I've seen some exciting and fun progress. The pallet wall went up really quickly, thanks to my handy friend, Andy. I will add a shameless plug for this dude right here. If you are local or live in the Twin Cities area, this guy can do it all. I'm just not giving you his number until my project is finished. Kidding of course. My kids have already starting invading this space. Seriously. I am hoping I can get some pictures of the space before it is completely destroyed. This corner is pretty much complete. This next week, my lighting should arrive for the pallet wall and the wall adjacent from the tv will get some new artwork. I am keeping these elements a complete surprise. The TV wall got a fun accent. If you follow me on Instagram, you can check it out there. I have pretty much been working every single day on these stair treads. These are not "technically" a part of this One Room Challenge, but this multipurpose room and the stairs are the last two pieces of the basement that needed finishing, and I am determined to just GET IT DONE! Staining stair treads will not be added to my DIY list of "I would do that again." I should have just forked over the big bucks to the professionals on this one. I think when it's all said and done, they will look amazing. Just don't want to work on these ANY more! I am planning on adding a little nostalgia in the nook under the stairs that run's into this space. The main purpose of this space is to use it as a music cubby. I thought some black and white with a splash of color will be fun here. This weekend we are taking a break from the multipurpose room and starting to tackle the stairs. The existing treads were nailed AND glued down, so we will need to take them off, scrape the glue, paint all the risers, and the skirting before putting the new treads on. I still have a long to do list, but I am trying to take it day by day. I made myself a check list which is super helpful in keeping me on track for completion! I appreciate every single encouraging comment you guys have made. Your amazing words keep me motivated to finish strong until the end! I love following everyone that has participated in the One Room Challenge. You can check them all out here! The wood looks so great against the charcoal grey Stephanie!! Love that warm/cool combo. I feel your pain on the staining that never ends, but you are going to be so excited when these six weeks are behind you and this space is totally done!!!!!!! This is going to be such a great room! I love the wood wall! I am also doing the ORC challenge and am struggling with the hectic timeline. Thank you Emily! I'm heading over to check out your space right now! Hang in there from one crazy ORC lady to another!